This page of Venice Italy map has information about this very unique town, built on 117 islands, with 150 canals instead of streets and 431 bridges. -Left Click on any of the 4 arrows in the top left corner and the map will pan in the corresponding direction of the arrow. Venice is a tourist attraction itself, capital of passion and romanticism, home to some of the world most impressive buildings, awesome museums and fine art galleries. Art is everywhere here and Venice is visited by many thousands of visitors every year. It is a city that must be discovered on foot, perhaps by losing oneself in the magical labyrinth created by lanes, small and large squares and canals. 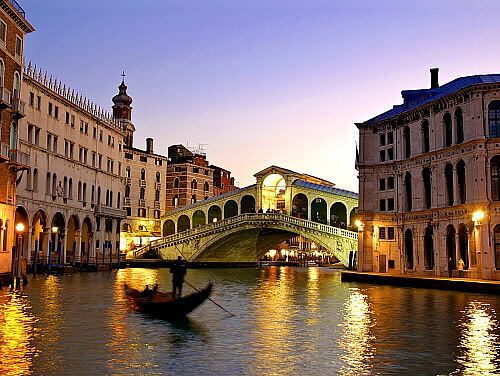 Venice is really a place like no other, with its unusual alleys, watercourses and way of life. It guarantees emotional enchantment all year round. The main and extraordinary waterway is the Canal Grande, which is over 3800 meters, with its majestic palaces and splendid Rialto Bridge. With its typical upside-down S shape, it splits the city from Piazzale Roma to St. Mark's Basin. Studies have revealed that once may have been a bed of the river Brenta, later diverted. Venice was divided since ancient times in six districts, in ascending order of size: Santa Croce, San Polo, San Marco, Dorso Duro, Cannaregio and Castello, the most populated. The streets of Venice are called "Calli", from Latin Callis - pathways: there are over 3000.It is so easy and pleasant to get lost in a maze of channels of history and picturesque corners. Venice is a magical place to explore and experience: unique environment to enjoy the day with an atmosphere so romantic in the evening. Venice need to be visited day and night to get the real unforgettable feelings: find your Venice Hotels, search for them on the Venice Italy map and make your reservation before you leave.